Mmmmm that looks so good. I hate looking at this site when I'm hungry!! Good job on the cake though, I like the fruit decoration on it, it is nice! Oh lord... I love lemony things and I want a slice of your cake! It looks soooo good. Boxed mix, or from scratch? The cake was a mix, I have to admit --- I was short on time, and wanted to concentrate on the decorating. 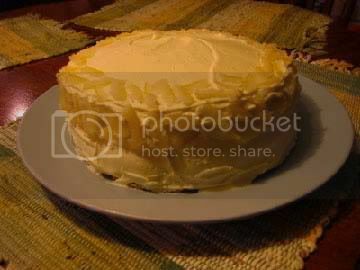 The icing was a simple no-cook buttercream, with lemon juice and lemon rind. I candied the lemon peel for the decoration, too --- boil thin slices in sugar syrup (1/2 c. sugar and 1/2 c. water) for about 3 mins, then drain WELL and toss the pieces in some more white sugar to coat.